Ginger was introduced to China by way of India more than two thousand years ago and is believed to have originated in the tropical jungles of Southeast Asia, according to The Practical Encyclopedia of Asian Cooking. It has a very distinct aroma and sharp flavor and is widely used in Eastern cuisine, not just for its flavors, but for its medicinal value also. It’s thought that ginger helps digestion, soothes coughs and eases nausea. Fresh ginger root is sold in most super markets. It has a light brown skin that is easy to removed and the flesh is diced or grated before being added to a dish. It’s also available in dried, ground and pickled form. For this recipe, I make an Asian sauce featuring fresh ginger, hoisin sauce and orange. I apply it to the beef at the end of cooking and serve it on the side of the finished plate. It has a sweet, citrus flavor with a ginger and garlic base, perfect for a warm summer night in the backyard with a hot grill to cook on and cold drinks to go around. I love using ginger. 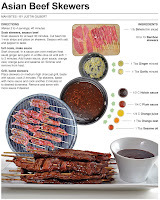 During the first winter I was in Fort Wayne I made a Christmas dish for the family that featured ginger and hoisin sauce, two of the ingredients here. It was a vegetable medley with cauliflower, broccoli and red peppers. I thought it was really tasty and complimented the roasted chicken it was served along side of. Dad ate a little and he didn’t seem all that happy. I asked him what was wrong, he said very frankly “Vegetables taste like soap!” He obviously wasn’t a fan of the ginger. I really don’t think the dish had enough in it to really taste like soup, but that’s what Dad thought of the dish. I have since made many recipes that have featured ginger and shared with Mom and Dad and he has either gotten used to the taste or he just doesn’t say anything about it any more. 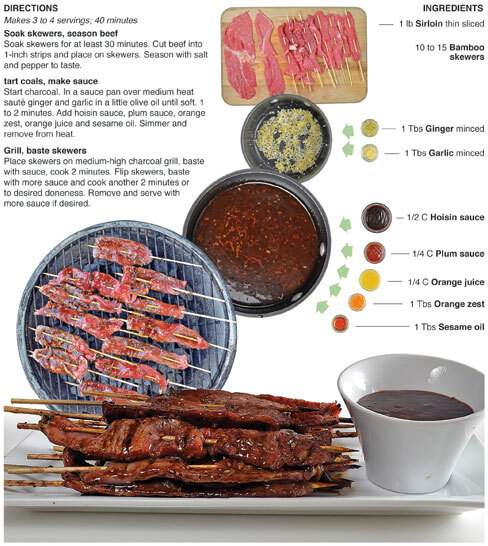 Soak skewers for at least 30 minutes. 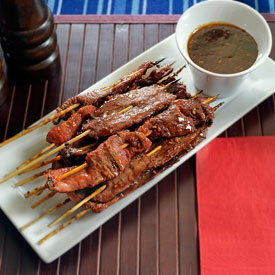 Cut beef into 1-inch strips and place on skewers. Season with salt and pepper to taste. Start charcoal. In a sauce pan over medium heat sauté ginger and garlic in a little olive oil until soft. 1 to 2 minutes. Add hoisin sauce, plum sauce, orange zest, orange juice and sesame oil. Simmer and remove from heat. Place skewers on medium-high charcoal grill, baste with sauce, cook 2 minutes. 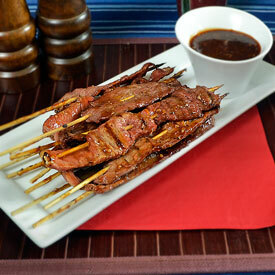 Flip skewers, baste with more sauce and cook another 2 minutes or to desired doneness. Remove and serve with more sauce if desired.